Ahh, Klamath! The very home of Crater Lake. Half a hop from the Lava Beds National Monument. Smack dab in the middle of the largest migratory bird route in the west. Meet me in Klamath! In sunny, uncrowded Klamath County — just five hours from Portland in Southern Oregon — 300+ days of blue skies are made for outdoor play. Volcanic peaks, deep mountain lakes, pine forests, and vast wildlife refuges make for a wonderfully diverse set of winter adventures. Here are seven jump-starts to discovering Klamath’s winter recreational opportunities. Rent skates and glide on smooth-as-glass ice amid forested hills at the Bill Collier Community Ice Arena in Klamath Falls. If you’re envisioning your average ice arena in the mall, think again. Collier Ice Arena is a state-of-the-art, free-standing ice complex situated on the grounds of the Running Y Ranch Resort. The outside facility hosts amateur ice events and regional tournaments. Worried about your wobbly ankles? Keep your shoes on and try a free “learn-to-curl” or “broomball” session taught by local experts. Then, it’s a short drive to the rink from your lodge room or chalet at the Running Y. Weather permitting, cross-country ski the ranch’s 3,600 acres along the shores of Upper Klamath Lake. 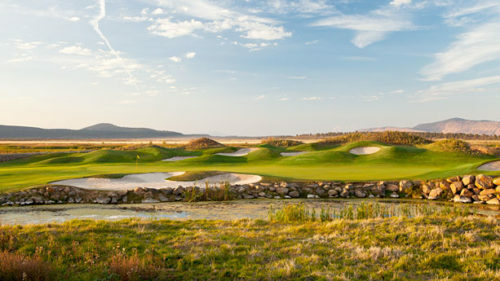 Then, warm up in the indoor pool and hot tub, get a spa treatment at the Sandhill Spa and enjoy the views of the stunning landscape and Oregon’s only Arnold Palmer Signature Golf Course from the resort’s Ruddy Duck Restaurant. Get a group of friends or family together and rent one of the Crater Lake Bungalows in pine woods on Agency Lake, the shallow and northern end of Upper Klamath Lake — midway between Crater Lake National Park and Klamath Falls. Bring sleds and tubes; 20 minutes away is the Annie Creek Sno-Park in the Fremont-Winema National Forest. Its warming shelter is next to a huge, treeless snow bowl made for sledding. For sunrise or sunset wildlife watching, walk the trails of the nearby Wood River Wetlands, a 3,200-acre marsh on the north end of Agency Lake that is home to a vast array of wildlife, and is part of the famous Klamath Birding Trail. Ready for a backcountry adventure? 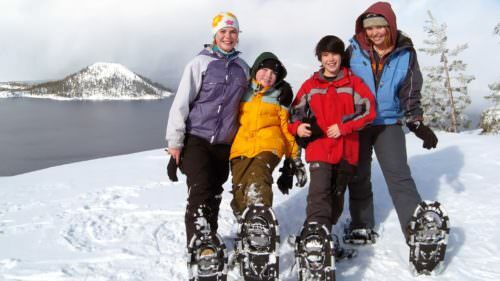 Head 40 miles west of Klamath Falls into the Southern Oregon Cascades and stay at Lake of the Woods Mountain Lodge and Resort, with stunning views of the crystal-clear Lake of the Woods and majestic Mount McLaughlin. Nearby, explore the Fremont-Winema National Forest by snowshoe, skis or snowmobile, with 165 miles of signed and groomed trails in the Great Meadow on the lake’s north shore. For a bigger challenge, tackle the slopes of a nearby volcano, Brown Mountain. Want to try ice-fishing on the lake? The resort can set you up with an ice auger, sled, and ice house rental, and sell you a fishing license and pole. Crater Lake National Park can get 500 inches of snow in winter, and cabins at Crater Lake Resort put you just 9 miles from this snowy wonderland. In the park, get out your sleds, cross-country skis or snowshoes and revel in the powder and miles of ungroomed trails. Take a two-hour snowshoe walk along the caldera rim with a park ranger, held once daily on weekends. Snowshoes are free but advance reservations are recommended, so call ahead. If you have a large group, weekday walks can be arranged too. The little ones will enjoy awesome sledding in the Rim Village area. Klamath County’s far northwest corner is a rugged place, high in the Cascades. With a home base at Willamette Pass Inn & Chalets in Crescent Lake, you’re just 7 miles from crowd-free runs at Willamette Pass Ski Resort. Your quads will get a workout: No lift lines means nonstop action on 29 runs. But you’ll have plenty of reasons to stop and rest, mid-run, to take photos of the surrounding Cascade peaks and lakes. With a 1,563-foot vertical drop, runs range from easy cruises to steep and deep in the trees. Cross-country skiers and snowshoers will delight in 12 miles of groomed trails. Also up in the north end of Klamath County are cozy, retro motel rooms at the Woodsman Country Lodge in Crescent. Stay here and you’re a half-hour drive from cross-country skiing on 15 miles of groomed forest roads around beautiful Crescent Lake. A 20-minute drive the other direction leads to a daylong adventure at the Walt Haring Sno-Park. Cold, dry snow and easy trails through ponderosa pine are good for beginners, with a few climbs that reward you with views of Mt. Thielsen. Or snowmobile 12 miles to Miller Lake, another gorgeous Cascade mountain lake with big views of Mt. Thielsen. You don’t have to be a bird nerd to appreciate the incredible diversity of wildlife in Klamath. Nature lovers and photographers, bring binoculars and a camera and spend a few days at Crystalwood Lodge. 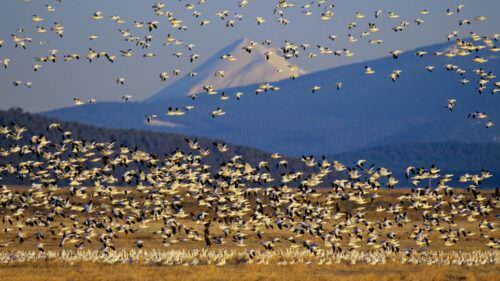 Nearby, you’ll find the Upper Klamath National Wildlife Refuge, where the marshes and open water are part of the Pacific Flyway, a major north-south corridor for migrating birds. From November to April, 500 to 800 bald eagles forage in the Klamath Basin, with peak numbers in February, making the Klamath Basin home to the largest wintering population of bald eagles in the lower 48 states. Book a personalized wildlife tour through a local outfitter like Lonesome Duck, or walk the 2.5-mile Lake Ewauna Interpretive Trail near Klamath Falls. Further south, 35,000 white geese can be seen in late winter at the Miller Island Unit wildlife area. It’s a breeze to rent winter equipment and gear in Klamath Falls. Permits are required at sno-parks. Always check road conditions before you go. Check with the local tourism office, Discover Klamath, to get current conditions and for other travel-related questions: 800 445-6728; [email protected]. Laura O. Foster writes books about Portland and nearby places in the Pacific Northwest. Her work has been featured on Oregon Field Guide, Oregon Art Beat, AM Northwest and KBOO, as well as in The Oregonian, Willamette Week and the Portland Tribune. An Oregonian since 1989, she lives with her husband on 20 acres of forest in Northwest Portland with the youngest of their four children. 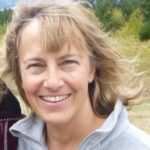 Her newest book is "Columbia Gorge Getaways: 12 Weekend Adventures from Towns to Trails."